Patented PROHOLD® Low-Profile hydraulic single chucks have many built-in features that make them indispensable workholding devices for milling and turning operations. The chucks can be mounted on their sides. Four chucks mounted flat in series on a vertical mill table. • Integral hydraulic porting connections built into each individual chuck provide a continuous hydraulic supply to each chuck in a series from one common hydraulic pumping unit attached to one of the individual chucks. • Each chuck is still individually operated by the operator, as required, by an individual valve mounted on each chuck. • Each chuck has its own pressure gauge indicating the clamping pressure applied to the jaws for that chuck and also internal accumulators. • The maximum individual jaw travel is 1.500″ from fully open to fully closed position. • Each chuck also has an external grease fitting for periodic lubrication maintenance. • The back face is slotted so that it can be keyed to the machine tool table and uses bolts through the body for mounting. 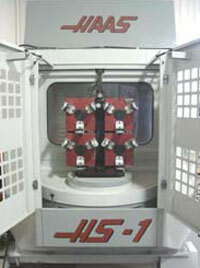 • On VTL applications, a hole pattern and back face geometry is matched to the spindle nose adaptor. • Over 40% of the area of the face of the chuck may be drilled and tapped for additional work supports etc. PROHOLD® chucks are of steel construction or aluminum where weight savings is essential. PROHOLD® flat 3-jaw chucks, and SELF-CENTERING 2-jaw chucks, offer unique space saving workholding. • The hydraulic units may be mounted on their backs, or one of two sides for horizontal or vertical part holding. • Pressure and tank ports are SAE#4, spotfaced for “O” ring common manifold mounting. • These chucks are available in sizes ranging from 8-inch to 66-inch and can be fitted with quick-change top jawing. • Chucks 24″ and above are available in 6-jaws. All PROHOLD® chucks are of available in mechanical or hydraulic actuation. • Hydraulic chucks readily integrate into robotic automated cells by replacing the standard manual operating valve with a crossover plate. 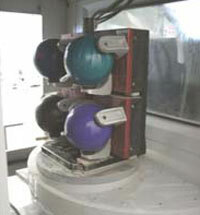 This fixturing installation is activated by the machine controller for loading and unloading bowling balls on the fixture. The machine controller sends a signal to the pump via M-code in the program which allows the unclamp and re-clamp of the balls at the load unload station only. By pushing pallet ready, the operator actuates the hydraulic control system to clamp. After the pallet shuttle of a finish machined load, the control unclamps the chucks so the operator can unload finished parts and re-load for another cycle. A new line of hydraulic chucks from PROHOLD® for VTL’S, VMC’s, and HMC’s, enables additional hydraulic operations to be done prior to or after the initial chucking of the workpiece. 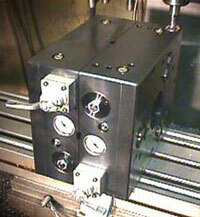 There is no mechanical drawbar or external cylinder for open/close of the jaws. Hydraulics are internal to the chuck body which allows the unit to be charged up and sent into a machine tool untethered by a continuous oil supply. variety of work supports, swing clamps, etc. may be combined with the chuck jaws operation. A removable side plate allows easy access to the on board hydraulic componentry: Pressure gauge, pilot operated check valve, crossover plate for ID/OD chucking changeover, sequence valve adjustment. The sequence valve may be closed entirely which allows the “through the jaw” hydraulic circuit to act independent of the sliding master jaw circuit. This allows for oil to flow freely between all 2,3,4 or 6 jaws which, when combined with a properly designed top jaw, converts the unit to a compensating chuck. 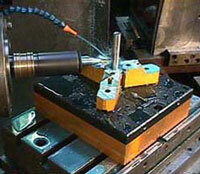 A center locating stud or mandrel may be placed in the precision ground center bore to locate a workpiece while holding it securely with the chuck jaws without pushing the part off centerline. 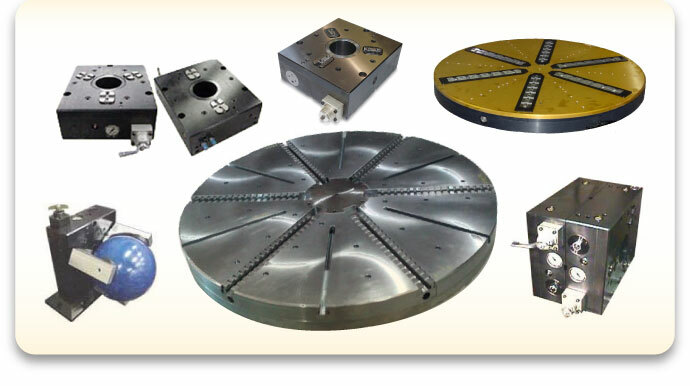 Although the chucks pictured are fed through rotary unions on the bottom end of the machine spindles, any of these type chucks can be charged up through quick disconnects on the OD of the chuck body, released, and sent into the machine tool. Internal hydraulic accumulators and the pilot operated check valve hold pressure. Through the machining cycle.This introduces the ability to have hydraulic chucking in a Mazak Integrex type 5 axis HMC for example and any pallet or chuck shuttle machine tool. For more information regarding our Low-Profile Chucks please fill out the form below and a representative will contact you as soon as possible. COPYRIGHT© 2016 PROHOLD® ALL RIGHTS RESERVED.